Bali is a dream destination for travellers around the world, and it’s so easy to see why. Between the food, the scenery, and the adventure, you’d be hard pressed to find something not to like about this beautiful island! If you’ve always wanted to visit Bali, but you don’t know where to start (or if you already know it like the back of your hand, but it’s calling your name once more! 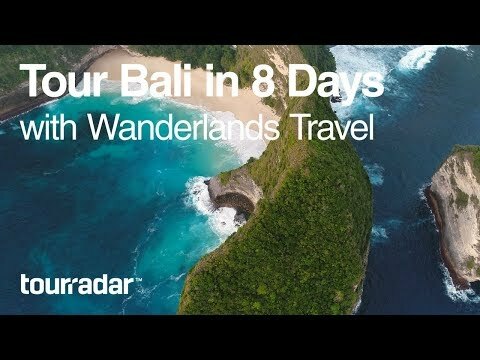 ), our guide to spending 8 days in Bali just may be perfect for you. This 8-day tour from Wanderlands Travel is perfect for explorers looking to cover as much of Bali as possible, while still enjoying chances to stop and smell the coffee – literally! Start your adventure at one of Bali’s famous beaches, Kuta Beach. Surfing, drinking from coconuts, and beachside sports? Sign us up. Of course, you can’t fully enjoy Bali until you’ve experienced its more cultural side. Step into Uluwatu Temple, an 11th-century seaside shrine home to statues, history, and monkeys. Immerse yourself in Balinese culture, and learn more about Hinduism, the island’s main religion. Next, travellers find themselves engrossed in two quintessential experiences: haggling in Ubud’s markets, and touring a traditional rice terrace. Enjoy shopping for food and souvenirs in a bustling night market, and then calm things down, with tours of rice and coffee plantations. Just make sure you enjoy the samples! The last stop on this picture-perfect tour of Bali is the Gili Islands. Three small islands off of Bali, there are few other places in the world where island life is as fun, relaxing, and beautiful. Enjoy a day in each: cycle through gorgeous nature, go snorkelling and spot sea turtles, or just relax on the beach. What’s island life if you can’t choose your own adventure, right? Speaking of choosing your own adventure, we bet choosing Bali for your next one sounds pretty tempting right now. Why not start planning? You can be on the beach before you know it.